Since you all were so eager for the last Christmas giveaway (congratulations, Melissa!) here’s another one, very literally hot off the press. This time it is for the older woman on your Christmas list. Leave a comment, and we’ll draw the winner on December 5! Canon Press Christmas Catalog is Here! Time for a little Canon Christmas Catalog shopping! Be sure to check out the Hello Ninja coloring book! If you’d like a free copy of Eve in Exile for someone on your Christmas list, leave a comment, and we’ll have a drawing on November 21 to see who wins! To register visit Canon Press! Session recordings will be available through December 20th. In these sessions, Rachel will give practical encouragement for mothers preparing to celebrate. A realistic look at a glorious holiday – we will discuss traditions, joy, stress, laughter, giving, receiving, and worshiping. So anyways, I wrote a book! What?! (Is it unseemly to mention it? Possibly, possibly.) On the other hand, if I don’t mention it, how would you know that you could pre-order it and get the sale price? In fact, if you pre-order now I hear that it’s possible you may even receive your copy before the official release date of September 27. So there you go! Oh. Did you want to know what it’s about? It’s about the whole, “What does it mean to be a faithful Christian woman” question. Does it mean we have to look and act like 1950s housewives? (Please no.) Does it mean we should fling ourselves into the corporate world and hope we get to witness to someone along the way? (That’s a pretty limp aspiration.) Should we care about the feminists? Should we agree with the feminists? Should we look at whatever the feminists are doing and then do the opposite? What is the chief end of woman? Do denim skirts turn out to be the key to all godliness and holiness? (You don’t have to buy the book – I’ll just tell you the answer to that one. The answer is no.) I tried to work through those kinds of questions in the book – in an attempt to offer a vision of what feminine faithfulness could look like right now, in the twenty-first century, as we look at the ever-quickening swirl of cultural chaos around us. How can we not merely stand against the crazy but actually use our uniquely feminine strengths to push back against the tide? If you’ve never heard of Lilias Trotter, here is a lovely little introduction which you can share with your kids. 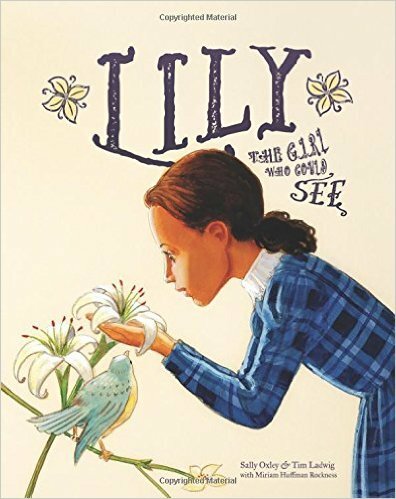 Lily, the Girl Who Could See is beautifully illustrated by Tim Ladwig and sweetly told by Sally Oxley & Tim Ladwig. It is the story of the Victorian English woman, student of the great artist John Ruskin, who chose to give her life ministering in Algeria and North Africa rather than follow Ruskin’s encouragement to become a famous artist. And of course, if you have heard of Lilias Trotter, you will definitely want to get this book, even if you don’t have children. Then go ahead and find out more about this impressive lady, and order A Blossom in the Desert by Miriam Huffman. This book includes some of Trotter’s lovely sketches and paintings, as well as samples of her writing from her diaries and journals. From there you may as well go whole hog and order her biography, A Passion for the Impossible, by Miriam Huffman Rockness, because Lilias Trotter is a woman worth knowing.